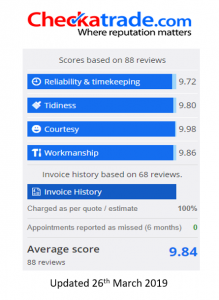 Our philosophy here at Sovereign Home Improvements is to make sure each customer receives the best possible level of service and quality of work from start to finish. However, don’t just take our word for it…. We urge all our customer to check our customer feedback and testimonials given on some of the best review sites on the internet. This providing YOU with independent references on our work. These include Check-a-trade and Which? TrustedTraders thus giving you peace of mind knowing you are dealing with a reputable and reliable business and people that care. From the moment you make contact with our office team, or marketing staff we believe in a friendly attitude towards our customers. Hopefully, our philosophy provides you with the reassurance you are dealing with a reputable company in an industry that is often polluted with rogue salesmen and shoddy workmanship. With a professional approach to the sales pitch, while giving our customers the best prices possible without all the gimmicks, this reassures our customers they are dealing with an honest, grounded and trustworthy family run business.